While tables are useful for looking up information or finding specific numbers, it’s usually easier to see trends and make sense of data overall using charts. To change how the answer to your question is displayed, click on the Visualization dropdown menu beneath the question builder bar. If a particular visualization doesn’t really make sense for your answer, the format option will appear grayed-out in the dropdown menu. You can still select a grayed-out option, though you might need to click on the chart options gear icon to make your selection work with your data. Once a question is answered, you can save or download the answer, or add it to a dashboard or Pulse. This option is for displaying a single number, nice and big. The options for numbers include adding character prefixes or suffixes to it (so you can do things like put a currency symbol in front or a percent at the end), setting the number of decimal places you want to include, and multiplying your result by a number (like if you want to multiply a decimal by 100 to make it look like a percent). The Smart Number visualization is great for displaying how a single number has changed over time. To use this visualization, you’ll need to have a single number grouped by a Time field, like the Count of Orders by Created At. The Smart Number will show you the value of the number during the most recent period, and below that you’ll see how much the number has increased or decreased compared to its value in the period before that. The period is determined by your group-by field: if you’re grouping by Day, the Smart Number will show you the most recent day compared to the day before that. Progress bars are for comparing a single number to a goal value that you set. Open up the chart options for your progress bar to choose a value for your goal, and Metabase will show you how far away your question’s current result is from the goal. Ah, gauges: you either love ‘em or you hate ‘em. …Or you feel “meh” about them, I guess. Whatever the case, gauges allow you to show a single number and where its value falls within a set of colored ranges that you can specify. By default, when you choose the Gauge visualization, Metabase will create red, yellow, and green ranges for you. The Table option is good for looking at tabular data (duh), or for lists of things like users or orders. The visualization options for tables allow you to add, hide, or rearrange fields in the table you’re looking at, as well as modify their formatting. Open up the visualization options for a table and you’ll see the Columns tab, which displays all the columns currently being shown in the table. Below that you’ll see a list of more columns from linked tables that you can add to the current table view. To hide a column, click the X icon on it; that’ll send it down to the “More columns” area in case you want to bring it back. To add a linked column, just click the + icon on it, which will bring it to the “Visible columns” section. Click and drag any of the columns listed there to rearrange the order in which they appear. Another super easy way to rearrange columns without having to open up the visualization settings is to simply click and drag on a column’s heading to move it where you’d like it to go. Note: changing these options doesn’t change the actual table itself; it just creates a custom view of it that you can save as a “question” in Metabase and refer back to later, share with others, or add to a dashboard. To format the display of any column in a table, click on the column heading and choose the Formatting option (you can also get there by clicking on the gear on any column when in the Columns tab of the visualization settings). Date style gives you a bunch of different choices for how to display the date. Abbreviate names of days and months, when turned on, will turn things like January to Jan, and Monday to Mon. Show the time lets you decide whether or not to display the time, and if so, how. You can include hours and minutes, and additionally seconds and milliseconds. Show a mini bar chart will display a small horizontal bar next to each number in this column to show its size relative to the other values in the column. Style lets you choose to display the number as a plain number, a percent, in scientific notation, or as a currency. Separator style gives you various options for how commas and periods are used to separate the number. Minimum number of decimal places forces the number to be displayed with exactly this many decimal places. Multiply by a number multiplies each number in this column by whatever you type here. Just don’t type an emoji here; it almost always causes a temporal vortex to manifest. Add a prefix/suffix lets you put a symbol, word, or whatever before or after each cell’s value. Unit of Currency lets you change the unit of currency from whatever the system default is. Currency label style allows you to switch between displaying the currency label as a symbol, a code like (USD), or the full name of the currency. Where to display the unit of currency lets you toggle between showing the currency label in the column heading or in every cell in the column. Then click on the gear icon next to the column that you want to format. Dates, numbers, and currencies tend to have the most useful formatting options. Sometimes is helpful to highlight certain rows or columns in your tables when they meet a specific condition. You can set up conditional formatting rules by going to the visualization settings while looking at any table, then clicking on the Formatting tab. Single color: pick this if you want to highlight cells in the column if they’re greater, less than, or equal to a specific number, or if they match or contain a certain word or phrase. You can optionally highlight the whole row of a cell that matches the condition you pick so that it’s easier to spot as you scroll down your table. Color range: choose this option if you want to tint all the cells in the column from smallest to largest or vice a versa. This option is only available for numeric columns. You can set as many rules on a table as you want. If two or more rules disagree with each other, the rule that’s on the top of your list of rules will win. You can click and drag your rules to reorder them, and click on a rule to edit it. If your table is a result that contains one numeric column and two grouping columns, Metabase will also automatically “pivot” your table, like in the example below. What this does is it takes one of your columns and rotates it 90 degrees (“pivots” it) so that each of its values becomes a column heading. If you open up the visualization settings by clicking the gear icon, you can choose which column to pivot in case Metabase got it wrong; or you can also turn the pivoting behavior off entirely. Line charts are best for displaying the trend of a number over time, especially when you have lots of x-axis values. Bar charts are great for displaying a number grouped by a category (e.g., the number of users you have by country), and they can also be useful for showing a number over time if you have a smaller number of x-axis values (like orders per month this year). Area charts are useful when comparing the proportions of two metrics over time. Both bar and area charts can be stacked. Trend lines Another useful option for line, area, bar, and scatter charts is trend lines. If you have a question where you’re grouping by a time field, open up the visualization options by clicking the gear icon, and turn the Show trend line toggle on to display a trend line. Metabase will choose the best type of line to fit to the trend of your series. This will even work if you have multiple numbers selected in the View section of your question. It won’t work, however, if you have any groupings beyond the one time field. Also called Combo Charts, the Line + Bar chart lets you combine bars and lines (or areas) on the same chart. If you’re trying to group a number by a column that has a lot of possible values, like a Vendor or Product Title field, try visualizing it as a row chart. 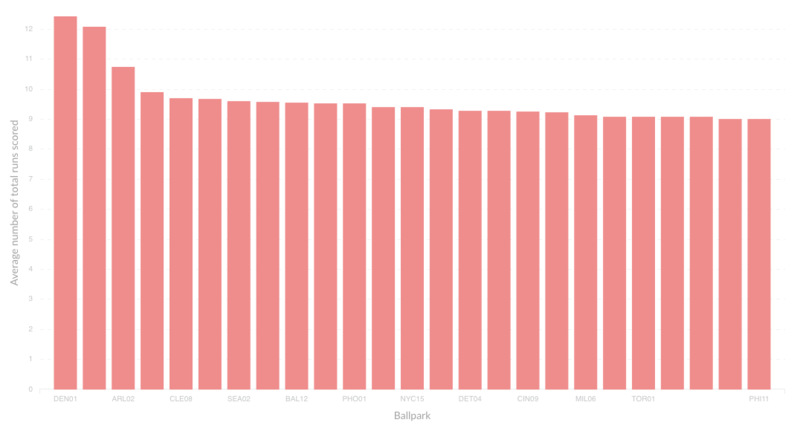 Metabase will show you the bars in descending order of size, with a final bar at the bottom for items that didn’t fit. If you have a bar chart like Count of Users by Age, where the x-axis is a number, you’ll get a special kind of chart called a histogram, where each bar represents a range of values (called a “bin”). Note that Metabase will automatically bin your results any time you use a number as a grouping, even if you aren’t viewing a bar chart. Questions that use latitude and longitude will also get binned automatically. Data — choose the fields you want to plot on your x and y axes. This is mostly useful if your table or result set contains more than two columns, like if you’re trying to graph fields from an unaggregated table. You can also add additional metrics to your chart by clicking the Add another series link below the y-axis dropdown, or break your current metric out by an additional dimension by clicking the Add a series breakout link below the x-axis dropdown (note that you can’t add an additional series breakout if you have more than one metric/series). Display — here’s where you can make some cosmetic changes, like setting colors, and stacking bar or area charts. With line and area charts, you can also change the line style (line, curve, or step). You can also set a goal line for your chart, display a trend line, or configure how your chart deals with x-axis points that have missing y-axis values. Axes — this is where you can hide axis markers or change their ranges, and turn split axes on or off. You can also configure the way your axes are scaled, if you’re into that kind of thing. Labels — if you want to hide axis labels or customize them, here’s where to go. Scatterplots are useful for visualizing the correlation between two variables, like comparing the age of your users vs. how many dollars they’ve spent on your products. To use a scatterplot, you’ll need to ask a question that results in two numeric columns, like Count of Orders grouped by Customer Age. Alternatively, you can use a raw data table and select the two numeric fields you want to use in the chart options. 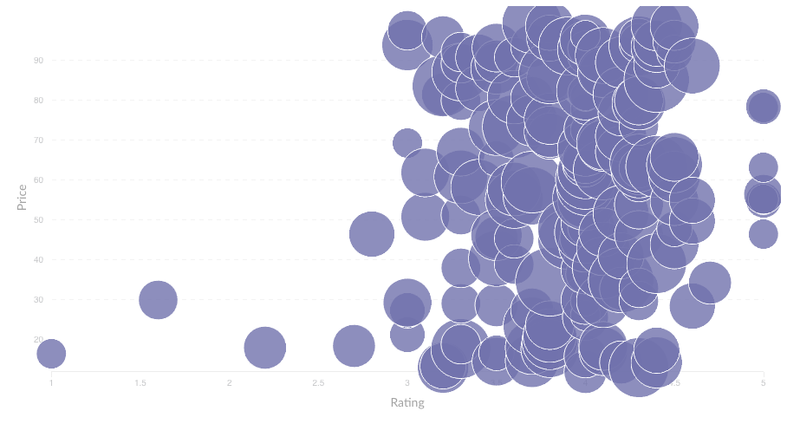 If you have a third numeric field, you can also create a bubble chart. Select the Scatter visualization, then open up the chart options and select a field in the bubble size dropdown. This field will be used to determine the size of each bubble on your chart. For example, you could use a field that contains the total dollar amount for each x-y pair — i.e., larger bubbles for larger total dollar amounts spent on orders. Scatterplots and bubble charts also have similar chart options as line, bar, and area charts, including the option to display trend or goal lines. 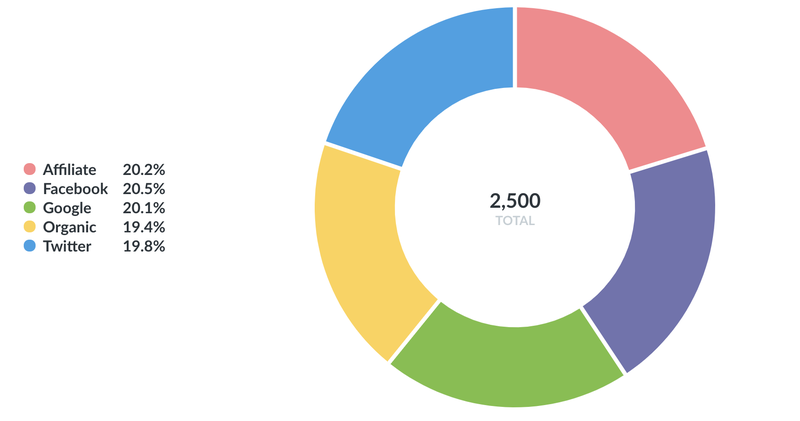 A pie or donut chart can be used when breaking out a metric by a single dimension, especially when the number of possible breakouts is small, like users by gender. If you have more than a few breakouts, like users per country, it’s usually better to use a bar chart so that your users can more easily compare the relative sizes of each bar. 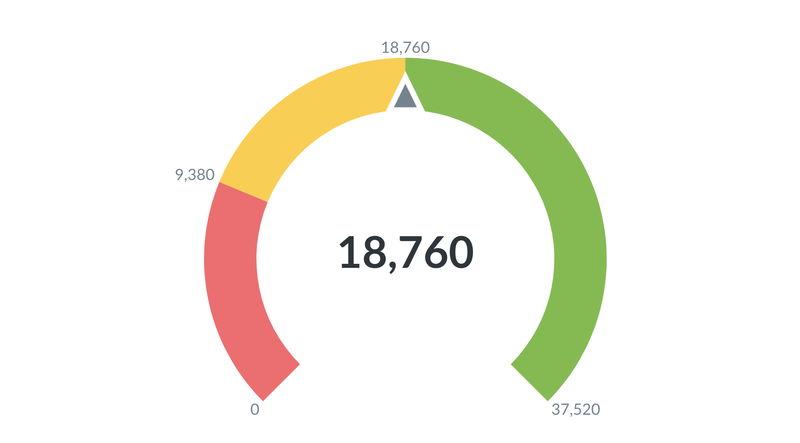 The options for pie charts let you choose which field to use as your measurement, and which one to use for the dimension (i.e., the pie slices). You can also customize the color of each piece slice, the pie chart’s legend, whether or not to show each slice’s percent of the whole in the legend, and the minimum size a slice needs to be in order for it to be displayed. Funnels are commonly used in e-commerce or sales to visualize how many customers are present within each step of a checkout flow or sales cycle. At their most general, funnels show you values broken out by steps, and the percent decrease between each successive step. To create a funnel in Metabase, you’ll need to have a table with at least two columns: one column that contains the metric you’re interested in, and another that contains the funnel’s steps. For example, I might have an Opportunities table, and I could create a question that gives me the number of sales leads broken out by a field that contains stages such as Prospecting, Qualification, Proposal, Negotiation, and Closed. 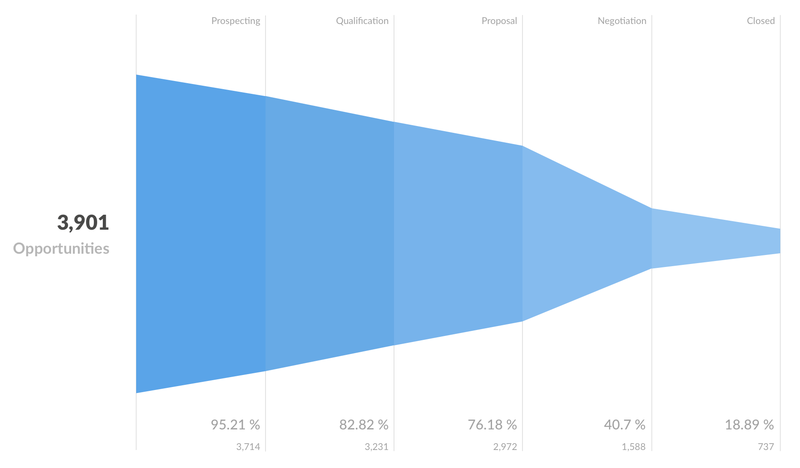 In this example, the percentages shown along the x-axis tell you what percent of the total starting opportunities are still present at each subsequent step; so 18.89% of our total opportunities have made it all the way to being closed deals. The number below each percent is the actual value of the count at that step — in our example, the actual number of opportunities that are currently at each step. Together, these numbers help you figure out where you’re losing your customers or users. United States Map — Creating a map of the United States from your data requires your results to contain a column that contains states. 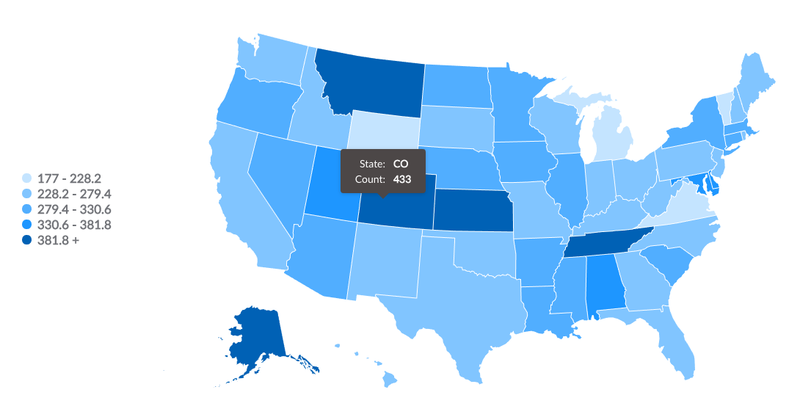 This lets you do things like visualize the count of your users broken out by state, with darker states representing more users. Pin Map — If your table contains a latitude and longitude field, Metabase will try to display it as a pin map of the world. This will put one pin on the map for each row in your table, based on the latitude and longitude fields. You can try this with the Sample Dataset that’s included in Metabase: start a new question and select the People table, use raw data for your view, and choose the Map option for your visualization. you’ll see a map of the world, with each dot representing the latitude and longitude coordinates of a single person from the People table. When you open up the Map options, you can manually switch between a region map (i.e., United States or world) and a pin map. If you’re using a region map, you can also choose which field to use as the measurement, and which to use as the region (i.e. State or Country). Metabase also allows administrators to add custom region maps via GeoJSON files through the Metabase Admin Panel. Now let’s learn about sharing and organizing your saved questions.